Sometimes when we repeat what somebody said we literally repeat them. We use the exact words that they dais. This is called direct speech and we put quotation marks around the words the person said. I like quotation marks. They look like little teeth, so we can see the words coming out of the person’s mouth. Sometimes we just repeat the person’s idea and not the exact words they used. This is indirect speech. We don’t use quotation marks because we are not using that person’s words. Indirect speech: Peter said he likes donuts. It’s easy with donuts. Donuts don’t have feelings. It gets harder with people. Did Peter say “Mary is nice,” or did Peter say he likes Mary? 1 Start at the bottom. 2 Have the boy and the girl each say something. 3 Have the boy tell the girl what she said, direct speech. 4 Have the boy and girl paraphrase each other, indirect speech. 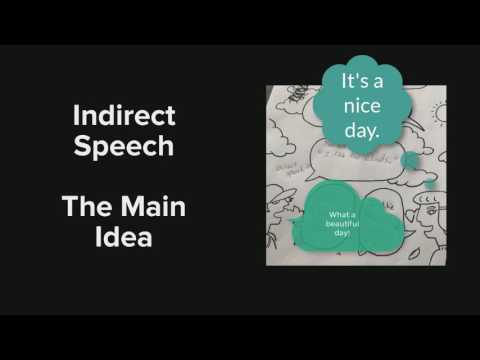 This activity helps us practice direct and indirect speech.